The image starts in your head like a perfect Norman Rockwell painting. You and your kids will gather in the kitchen to cook up a great meal of spaghetti and meatballs. Sally will stir the sauce while Junior butters the bread. You’ll all sing Beatles songs as you cook together happily. And then something happens—the painting morphs into a nightmarish scene. There is spaghetti sauce splattered on the walls, meatballs stuck to the ceiling and Junior almost sliced off his finger with the butter knife. Welcome to dinnertime. Cooking with children isn’t easy, but it doesn’t have to be hard. Hot stoves, sharp knives and messy results make many moms and dads decide the kitchen is no place for their kids, but with the right kitchen and task planning, little hands can be a big help—and learn valuable lifelong skills. “Kids learn to eat healthier and appreciate food that’s made from scratch,” said Julie Fabing Burleson, co-founder and co-owner of Young Chefs Academy (YCA), a cooking school for kids with 60-plus locations in the United States and four internationally. “Kids also are more willing to try things if their little hands are part of the process of preparing it." In addition to teaching cooking skills, food and kitchen safety, and healthy eating, kitchen time with kids can reinforce math and reading skills, teach how to follow directions, foster teamwork and encourage creativity. Plus, it’s a fun way for families to spend time together. “When they reflect back, many people’s best memories are eating a meal or preparing it,” said Burleson. “Sometimes preparing a meal together is more important than sharing one." So how can you make your kitchen a safe, accessible and fun place for kids to learn to cook? Designing a kitchen for kids is just like making a meal: Create a recipe for success, stock up on the right ingredients and then get cooking! All YCA classes are taught in kid-friendly classrooms that provide “real” kitchen settings. “Our locations all look as different as any kitchen in a home might,” said Burleson. “Kids go home to standard kitchens and we want to help them learn to adapt. We don’t believe in lower countertops because kids are always growing. A nice, sturdy stepping stool with rubber legs that won’t tip over is all you need." While you don’t need a special countertop height, a large, easy-to-clean work surface is a must. “Make sure you have plenty of uncluttered workspace for your kids to use,” said Burleson. “I love my kitchen island, so I can set my kids up on the side away from the stove and oven and know they are out of harm’s way but still right there." Many appliances and fixtures are designed with kid safety in mind. Dishwashers, refrigerators, stoves and ovens with child-lock features, as well as anti-scald faucets, can reduce a child’s risk of injury. Of course, basic childproofing supplies like cabinet locks can keep little hands from exploring where they should not. “Kids should also tie back their hair, wear closed-toe shoes and roll up their sleeves while cooking,” said Burleson. “You should also teach them about cross contamination, how to clean up spills and the proper way to wash your hands. Keeping the workspace neat makes for a safer kitchen." To help kids participate in meal preparation, Burleson suggests investing in utensils and tools made just for little hands. YCA uses and sells Furi, Rachael Ray’s Yum-o! line of children’s cooking products, which includes knives with blade guards, soft-grip kitchen scissors and cut-resistant gloves. Launched in 2006 by Rachael Ray, Yum-o! is a nonprofit organization that empowers kids and their families to develop healthy relationships with food and cooking by teaching families to cook, feeding hungry kids and funding cooking education and scholarships. Curious Chef also offers a line of utensils and gadgets for kids. Designed with small hands in mind, the complete line of 49 cooking products and accessories includes nylon knives, cutting boards, spoons, whisks, rolling pins and a pizza slicer, apple corer, melon baler and lemon zester. A kid-size apron is also great to have, suggested Burleson. “It would stress me out that my kid might spill something on his favorite shirt,” she said, “but if he has an apron on, I don’t worry as much about messes." “Keep all of the kids’ tools and utensils in a tub or a drawer that is easy for them to reach,” advised Burleson. “Keep the placement of their drawer or cabinet in mind so they are not coming into your work area or near the stove to get what they need." Once you’re set with your kid-friendly kitchen design and equipment, it’s time to start cooking. But what can kids really do? “Kids can do more than you think,” said Burleson. “If they can read, they can learn to do it." “Teach kids basic kitchen skills when you are not in the middle of preparing a meal,” advised Burleson. “It’s less stressful to show them how to measure dry ingredients when you are not trying to get dinner on the table. Kids would much rather crack an egg and stir it than put plates on the table, but when you are making a meal is not the time to try that for the first time." Once kids learn the basics, you can get them involved in actual meal preparation. “Mise en place is our mantra,” said Burleson. “It means ‘all things in order.’ Have your child order ingredients in separate containers, and then you can check them before they dump everything all together." While you should always give kids jobs they can handle, Burleson suggests you try to kick it up a notch. “Kids are smart these days,” said Burleson. “They know if you are giving them an easy job and just trying to get them out of your hair so you can get a meal on the table." 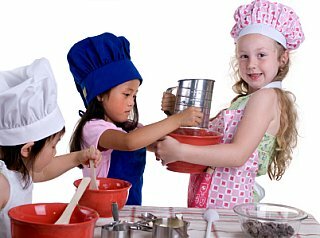 Remember that cooking with a child is about being together and getting creative. “If a recipe calls for the juice of a lemon, your three year old can probably do that,” said Burleson. “Lemons are cheap, so let her juice 10. She’ll have a great time and you can use the extra juice to make lemonade." YCA offers guidelines for what are age-appropriate jobs for kids in the kitchen, but supervision is always the key. “If it’s one on one, there is a lot kids can do,” said Burleson. “But Mom usually knows best. The same task might be a ‘no’ for one 10 year old but a ‘yes’ for a different six year old.” Activities to try include stirring, rolling, getting items out of the refrigerator or pantry, using the microwave, reading a recipe and more. “With a kid-safety glove, they can even learn to use a knife and chop,” said Burleson. “It’s limitless what kids can do when they learn the basics." Thanks Ellen for a great post. I have two young aspiring chefs of my own and can see how they can quickly get into trouble with a poorly designed kitchen. I also do Kitchen Design in Bucks County PA and don't ask the question if children will be using the appliances. Safety should always be a consideration. I'll start asking clients from now on. Thank you for the heads up!